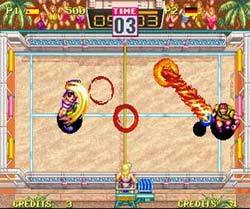 After this past weekend at the BaltiNARP, Windjammers was one of the few games that made me remember just how fun it was to play games in arcades. 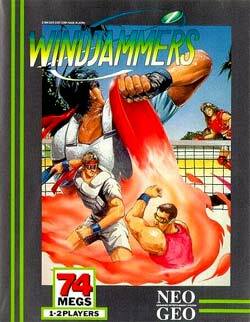 Hito Introduced the game to me on Friday and whenever I felt like playing something that wasn't a fighter or just to play a game, Windjammers was the game I went after. The game is pretty much Pong but much faster, more interesting, and actually in color. You have 6 different people to play as. (you know, the Spaniard buff guy, the even more buff black american, the female Japanese just to name a few.) each with their own differences in speed and power. But what makes this frizbee tossing game so fun is how long the matches can last. Sure there's a time limit for each round, but if both players are good, there'll be times where you're wasting time just to get 1 point. Speaking of points, there's 2 different ways of scoring. By getting it passed your opponent (depending on where you hit it, 3 or 5 points.) or by your opponent not catching a flyballish frisbee. As for the gameplay, it's simple. A is your simple throw. B is somewhat of a the flyball toss in the air. To block a firsbee, just stand still and press A before the firsbee hits you. Which makes the frisbee fly up in the air. Pressing A rapidly (or so we thought.) would encorage a rather power toss. Everyone has their different specials ranging from a circling fire frisbee, a frisbee that seems to glide on the wall railing. OR you can just press B which is a rather quick toss that's rather fast. So the large characters have to dash (which is pressing A when the firsbee's not in your hand.) to hustle over to grab it. The game is rather enjoyable for a revamped Pong. 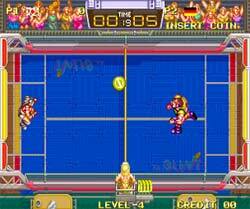 Plus it's a Neo Geo game so you can either find a emulator and try it out yourself or with a friend, or go down to Hito's house and try it. Either way, this game is awesome. Oh and please watch out for the Seizure Vs. Screen. It kinda made me wonder just how awful that porygon episode of Pokemon turned out to be.